Our Power Distribution Unit (PDU) replaces centralized circuit breaker panels allowing for power to be more efficiently distributed and controlled via a data bus. PDUs can be located throughout the aircraft allowing for easy configuration changes, if additional power is required, providing maximum flexibility in custom interior and VIP design. In addition to providing circuit protection functionality, our PDU provides power control as a remote controlled relay, load monitoring which can be used for trend monitoring of electrical devices and for automatic load shedding. 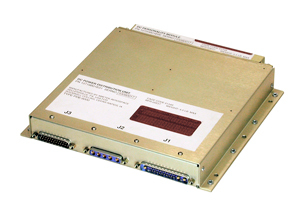 Our AMPHION Power Distribution Unit (PDU) is a thin, flat packaged array of AC or DC thermally mounted Solid State Power Controllers (SSPC) on a carrier board, offering a RS485 control bus. Each PDU has provisions for Master Rest and each individual SSPC can be addressed and each output status can be displayed. Each PDU connects to a field adjustable personality module that customizes each output on the PDU to a specific trip setting and multiple applications.